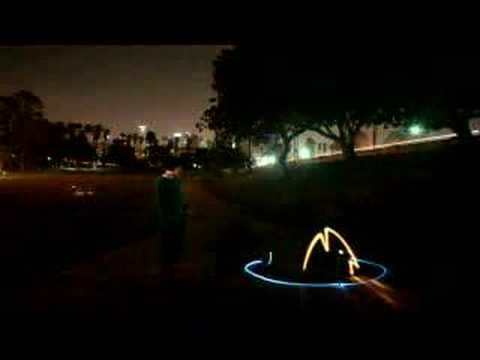 Back in 2005 some friends and I had some fun playing with a light-up Frisbee and long exposure photography. The results were pretty cool (as you can see by looking at Andy’s Photos here). I ask you to please look at our humble pictures before watching the the following videos of the professionals. This first video is from a Sprint commercial (that I have never seen on TV). There is also a cool making of video that shows you just how much work this art is (and prove that it isn’t just an effect). It really is a highly choreographed dance. Finally, the non-commercial work of this art form can be seen here, in a very cool short film. As I mentioned in my review of The Devil in the White City, I really only read on vacation. So it should come as no surprise that after my return from a summer vacation visiting family I am again writing a book review. I again read a historically placed book, although this time the book is pure fiction (which is good, because it means it can be my next book club selection, and yes I see how the fact I am in a book club and yet only read on vacation is a bit odd). Water for Elephants by Sara Gruen is a novel the combines many stories from the history of the circus, but rolls them up into one solid plot line. The book revolves around Jacob, a second generation Polish Immigrant who is either 90 or 93 years old. The book has two main plot lines, the first follows the 90ish year old Jacob in an assisted living facility as he deals with getting older, loosing memory, trying not to go senile, and looking forward to attending a traveling circus. This small part of the story is very well crafted and really made me think about what it must be like for the millions of elderly that live in assisted living facilities. It isn’t that Gruen paints an awful picture of nursing homes, it is more about the dehumanizing of the elderly, and recognition of one selves slow march to the end. For me, even though at this point in his life Jacob is bitter, frustrated, and generally not very nice, through his inner dialog I really became connected to him and sympathized with what it feels like to get older (regardless of how full your life has been). It is through this 90ish year old Jacob’s dreams that the major plot line of the book is told. It starts with Jacob studying to follow in his father’s footsteps as a veterinarian. However, as with many people in depression era America, plans do not always go as planned. He ends up joining a “Train Circus” and through him we are introduced to the very complicated and telling world of the depression era circus. Complete with racism, classism, sexism, cruelness, comradery, friendship, love, and caring. The story is gripping, not so much because the plot is exciting, but because Gruen does such a great job of getting you connected with the characters. From the working men, to the ringleader, to the midget clown you meet and get an understanding of each of them and through them understand the complex world in which they live a little more. Overall, I learned a great deal more about the hey day of the circus, which for me has always been a small spectacle attended by children, and being able to learn something while being entertained is always cool. I was also so drawn in by the story that I finished the book in under 24-hours, which for me is quite a feat. The book is definitely, at its heart, a love story, and if it were made into a movie could easily go the “chick flick” route, but it is also historically interesting enough and has enough other action that it is really a good read for anyone. It is officially no longer Amber’s Birthday, but we had a great day here in Dayton doing Amber activities. What are Amber activities? Well, shopping, Target, Scrapbook Stores, etc. We also got together with Amber’s side of the family for a Birthday Party at Amber’s Grandparents. We re-introduced the family to this blog so maybe our readership will now double 🙂 Check out the full set of pics here. It was cool to read the Post Bulletin online today and see an article about a student I have worked with. Stephanie this summer has been showing cattle at local shows. I am hoping to see her and another student of mine at the local fairs this summer. I am becoming very well versed in cattle showing. What is cool about Stephanie is like anything else in life she has not let the fact that she has CP get in the way of her doing what she wants to do. Read on and enjoy. I should start all of this by saying that the lead singer of Four Finger Five is my cousin Joe, which is the entire reason that I was sitting in the Fauenthal Theater at 11:30 PM on July Fourth. That isn’t to say that Four Finger Five doesn’t have a good local following, I just don’t normally run with the local music crowd. I had been wanting to see the band live for a couple years, but I only spend at max about a week every year in Muskegon and the scheduling never worked out. This year with a concert happening downtown after the Muskegon Fireworks and me actually knowing about it before hand my sister, Amber, and I went down to the theater to get tickets after the fireworks wrapped up. The Frauenthal is an awesome old theater with a beautiful old movie house styling and a rich history, a great place to see a performance of any kind. The show started very abruptly with a small crowd in the theater and a large crowd in the lobby getting the first of what I assume were many drinks (after whatever they had had before the fireworks). The point is most of the crowd was in some sort of altered state which made the show that much better for me, or at least made the dancing much more entertaining. The opening act was Ultraviolet Hippopotamus who played a short half hour set. The instrumentals weren’t too bad, but the singing was horribly out of tune (my guess is they couldn’t hear each other to harmonize) . Luckily, the crowd built to a few hundred people (eyeball estimate) before Four Finger Five took the stage, introduced by my old band director Jack Adams. Keeping in mind my family connection to the band, my unbiased review is that they were awesome. They have a unique sound for a modern band, a sound more at home in the 70’s then today. Which is exactly what makes them different and unique. It also gives them freedom to incorporate more instruments into their sound including at this performance, trumpet, trombone, sax, keyboards, and a fuller percussion set. Compared to more popular sounds of today, with minimal instruments and a heavier reliance on the lead singer, the music was refreshing. By the time they got to their last number at 2 AM (which consisted of a 15 minute jam session, including a couple of rappers from Grand Rapids who did some good but under-miked freestyling and an female R&B singer who did some uninspired and way over-miked freestyling) I was a Four Finger Five Fan. The band’s next performance is at Summer Celebration as the opening act for INXS this Saturday. They have just finished recording their first CD under the Terrestrial Records Label which I hear is possibly due out in November. You can listen to some of their music on their website and myspace page and see the rest of my (er Beth’s) pictures here. I am not sure how long this has been around, but I found a neat program off of the Simpsons Movie Page that allows you to create a Simpson Character modeled after yourself. These are the characters I made for Amber and I, they may be a bit idealized 🙂 but you get the essence. Give it a try for yourself. Yesterday was Amber and I’s First Wedding Anniversary we celebrated by taking a vacation from our vacation to go to Grand Rapids, MI for the day. We are currently on a week long vacation visiting family for the 4th and Amber’s birthday (the 6th). I am writing this post from my parent’s house in Muskegon, MI. We are here through the 4th before heading to Dayton, OH on Thursday to celebrate Amber’s Birthday at her Mom’s. As I said we took an excursion to Grand Rapids for our Anniversary (who wants to spend their wedding anniversary with their parents). The picture to the left was taken at the Frederik Meijer Gardens, which is a sculpture garden as well as an actual plant garden (I am sure there is a fancy name for that, but it isn’t coming to me). I suggest taking a look at all the pictures I have posted of the sculptures and plants (Including Amber “The Thinker” and some phallic looking cacti). While in Grand Rapids we stayed at the Amway Grand Plaza Hotel, one of the nicest in the area. Staying on a Monday of a holiday week we almost had the hotel to ourselves. This had a couple benefits, we didn’t hear any noise our entire time in the hotel and they upgraded our room to a suite after learning it was out anniversary. The room was spectacular, easily the best hotel room I had ever stayed in. We stayed on the 19th floor and had views of the Grand River, The Gerald R. Ford Presidential Museum, and downtown Grand Rapids. The suite had two rooms, 1 1/2 baths, and some of the most comfortable hotel furniture I have ever used. For our Anniversary dinner we went to the The Grille at 1913, which served Dry-Aged Steak (like one of our favorite Cities Steakhouses, Manny’s but had a much more attentive wait staff). The entire restaurant staff spoke to us by name, we had white-gloved service, two-waitresses to serve us, and the food was wonderful. The prices were comparable to Manny’s but the portions were smaller (i.e. you payed for the service). Besides the steak, I had some of the lightest garlic mashed potatoes I have ever tasted, they were so light it was almost like eating the essence of garlic potatoes. For dessert Amber had the largest creme brulee I have ever seen, and I had a chocolate souffle that gave me my first opportunity to eat 24 karat gold leaf. Overall our first anniversary was relaxing and elegant.